Research by the Windbridge Institute shows people with psychic abilities exist. These individuals are able to access information they shouldn’t be able to know. They do so significantly above the level of chance. It shouldn’t be surprising. People with varying degrees of psychic ability have been reported since antiquity. Some psychics have said anyone can build their psychic abilities, that they’re hardly innate. If psychic abilities are like other activities, maybe. The difference between psychic ability and almost anything else is that psychic ability is intangible. That being said, only the very rare person is going to have the innate ability of the NBA’s James Harden or Russell Westbrook. Conversely, the typical person developing their psychic abilities probably isn’t going to have the vision or spiritual fluidity of a psychic superstar like John Edwards, Jeane Dixon, or Edgar Cayce. Just like the basketball player and his missed shots and dribbled-away balls, the developing psychic will also have their errors as well. The 48-card Meaningful Messages deck, probably is not going to enable you to become a psychic superstar. It’s likely nothing will. Psychic ability is a gift. Yet you never know. Maybe you can get a lot better with some practice. Practicing renowned in either field requires some intangible gifts. Either way, the moments before drifting off to sleep are an opportunity to meditate and develop some ability in this area. The cards provide something of a how-to guide. The instructions call for choosing a card based on your intuition. You then focus on the message on the card and they wait, accepting that the deceased move on their own schedule. Those are the Meaningful Messages to which the deck refers. It’s easy to do this before bedtime, though the encounter doesn’t necessarily happen at night or while you’re asleep. It could happen, for example, during the day while you’re awake. For example, one card refers to a series of numbers that the deceased person you intended to contact would use to communicate with you. You might notice those numbers somewhere over the next few days. The instructions seem to imply that you’d be attempting this at the start of the day, though it doesn’t rule out any particular time. In following the instructions and trying the cards, I never directly communicated with the deceased person whom I had attempted to reach. Rather, I had a dream that seemed to indicate I might have reached another deceased person related to them. There was no direct message, only a dream where I returned to their old home and visited them there and spent some time with them as we had done years ago. The experience was interesting to me, however, because I hadn’t thought of him in several years. I’m not sure how long. What was also interesting was that the dream occurred three days later, early in the morning of what would have been the birthday of the intended person were they still alive. It could be a coincidence, though it seems like it would strain credulity to think all coincidences are really that and nothing more. The interesting thing is dreams are usually based upon the events of the last few days. The act of dreaming is part of the way that the mind processes new information. The fact that I dreamed about this individual whom I hadn’t been thinking for a long time before, would denote that this was a unique dream. Additionally, he didn’t seem to be representing anything. He wasn’t a symbol. The dream was a visit, like you might have with a family member or neighbor. Could this have been a psychic dream? It was definitely an atypical dream where there were several elements that were different from the symbol-laden dream with elements of the preceeding few days. So one dream in two months with these divergent characteristics isn’t exactly a motherlode of psychic dreams but it still is interesting. I haven’t turned into Edgar Cayce yet. 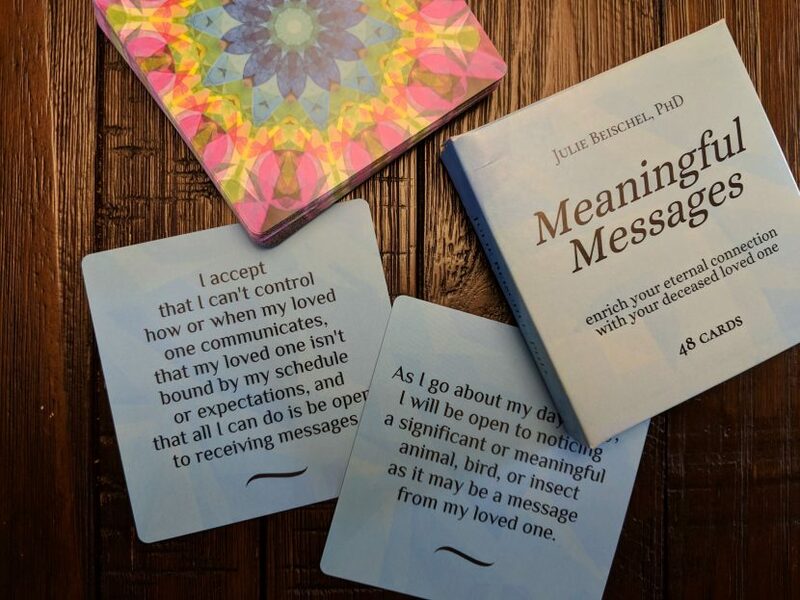 Yet, the Meaningful Messages card deck could be a breakthrough for some people because it would provide more coaching about how to communicate with deceased loved ones than they’ve ever had before.